Digital adaptive learning platforms become more and more important for education: no matter if in school, at universities, on-the-job trainings or in public educational centers, learners often have additional duties and, thus, limited time for knowledge acquisition. That is why they tend to learn in between other activities – anywhere and anytime. Efficient content access and the selection of appropriate media is crucial for a sustainable motivation and the successful achievement of course goals. On the other hand, teachers, content creators and other staff of educational institutions spend a lot of time on the development of didactic structures, digital learning media as well as the preparation and wrap-up of lectures. Fraunhofer FOKUS developed an infrastructure that satisfies the needs of both, learners and pedagogical staff. Participants of workshops, blended learning courses or online trainings get adaptive access to interactive course materials on various devices (e.g. smartphones, tablets, laptops, computers and even Smart TVs) via a centralized platform. 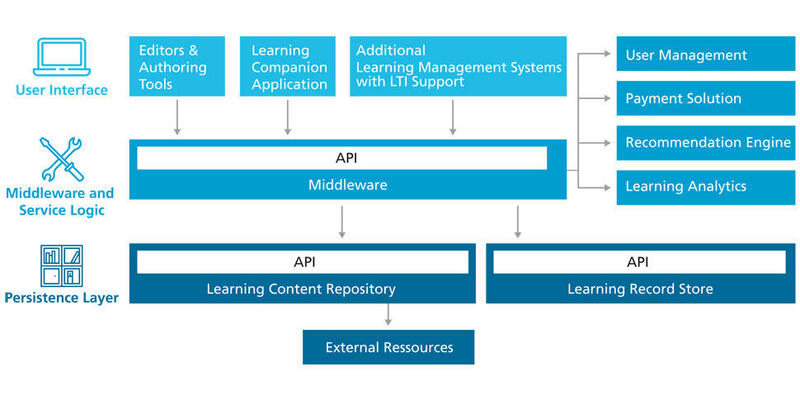 However, the contents are totally interoperable, reusable and independent from a specific Learning Management System (LMS), as their representation consequently follows open specifications, such as ADL Sharable Content Object Reference Model (SCORM) or IMS Learning Tools Interoperability (LTI). To stay updated on the latest developments of Learning Technologies and news of Fraunhofer FOKUS FAME, please subscribe to our newsletter. Content creators can develop a variety of different digital media assets with easy-to-use editors. The media types offered include digital articles, audio podcasts, demonstrative animations, videos with interactive elements as well as 360° videos and HTML5-compliant mini applications. Each learning object presents a self-contained topic that might be consumed separately from others. The related learning object metadata exhaustively describes the content and is based on open specifications such as ADL SCORM or IMS LOM. Quizzes, exercises and tests, in turn, are based on the IMS QTI specification. The contents are stored in a separate content repository in order to make them reusable for different learning environments, provide content-protection mechanisms, and re-sellable for third party stakeholders. Once created learning objects can be grouped into didactic blocks for micro-learning or offered as a hierarchical combination to be presented in interactive courses. In digital learning environments, analysis of students’ interactions with the learning objects provides important information about the students’ behavior. Thereby, all user interactions are persisted as ADL xAPI statements in a flexible learning record store. The analysis of the usage data leads to a better understanding of the learning process and, thus, optimizes teaching and learning. Fraunhofer FOKUS developed a Smart Learning Recommender (SLR) where students can keep track of their personal predicted knowledge level on different learning objects at every point in time and get personalized learning recommendations to overcome individual learning weaknesses. Besides content metadata, such as exam relevance, lecture times and pre-requisites, SLR takes different factors into account for each student and learning object, such as the user’s self-assessments, interactions with the content, performance in exercises, as well as individual forgetting curves and the learning progress of classmates. At the same time teachers can make use of this data to get an overview of the students’ overall progress and so are aware of potential knowledge gaps. 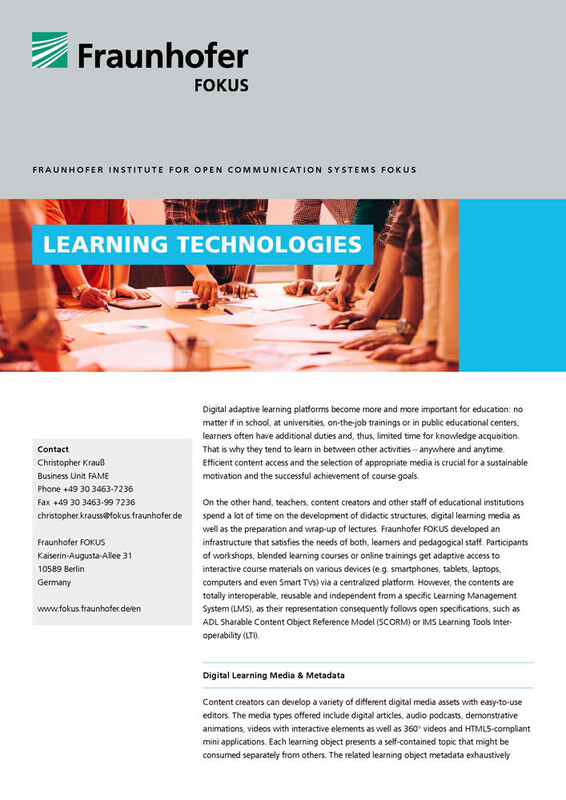 The utilization of Fraunhofer's Digital Learning Media, Learning Analytics and Recommender Systems makes content creation and teaching for institutional members more efficient and platform usage as well as the learning process for the course participants more effective and convenient. Since all components offer standardized APIs, they can be easily integrated into existing learning environments. The Fraunhofer FOKUS experts are happy to give further insights and provide advice for a seamless technology adoption. Allow the integration of gamification elements, for instance, badges, experience points, leader boards, etc.